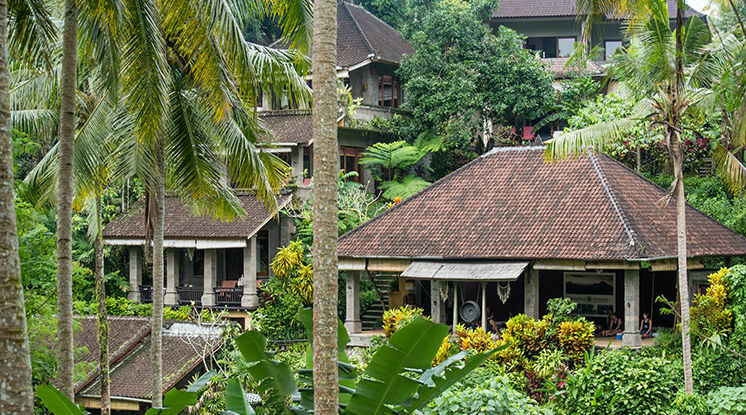 Stay in a comfortable accommodation in a lush environment with a Balinese palace in our front yard, delicious healthy meals, yoga and meditation classes, blissful spa treatments, cultural activities - all things you need to enjoy in a hassel-free, authentic, magical Bali retreat experience. We also offer Discovery Journeys which will take you off the beaten track. Our 2018 retreats are now one day longer - 7 days/6 nights! And what's more, the prices are same as in 2017, so you get to profit double. On our retreats calendar you will find a wide choice of retreats, catering to different needs. Peaceful and serene location with 14 comfortable and spacious rooms, two swimming pools, open pavilion, dining room, lush gardens and wonderful views of the rice fields as well as a spa offering high quality treatments and a beautiful yoga shala. Located in the hills of Ubud, where famous artists and writers have found peace and serenity, one of them Elizabeth Gilbert, the famous author of the best seller Eat, Pray, Love. Oneworld Retreats is by definition a retreat centre and only a few rooms are allocated for guests that are not participating in the retreats. Yoga group classes are exclusively for retreat participants. The minimum age for guests staying with us is 14 years. Our chefs are experienced and eager to offer you the freshest, healthiest and most tasteful meals, infused with love. Your special wishes and dietary requirements are taken care of whenever possible. All your meals are included in retreats and most of them are eaten together with the group in the beautiful jungle dining room but sometimes are also served in the privacy of your own balcony or at an outside location. Your personalized itinerary will inform you in detail. Lunch and dinner available on request for guests not participating in the retreats. The yoga we offered in retreats are Ashtanga, Hatha, Iyengar and many more. Participants are introduced to Pranayama, Asanas, relaxation techniques and rituals. Oneworld Retreats has an in-house spa offering high quality treatments including our renown ayurvedic Chakra Dhara massage. Only specially trained therapists with a deep spiritual sense perform the ayurvedic massages. They are a truly holistic experience. Besides retreats, we also offer discovery journeys; individual journeys that take you off the beaten track. They can either be booked as an additional treat to one of our retreats or on their own, according to your travel plans. Extend your stay in Bali and discover more of the island in a relaxed way with our professional drivers. Healthy, organic breakfasts are provided, prepared by our well-trained chefs. All dietary requirements are catered for. We have a new retreat every Sunday. On our retreats calendar you will find a wide choice of retreats, catering to different needs. Prices for 7 days/6 night retreats are Single/Twin share room. Arrive in airport International Ngurah Rai Denpasar (DPS). Transfers to and from the airport are included as well as to other locations in South Bali. The service is available 24 hours per day.